The Vikings by their very nature were natural warriors, raised with the keen desire for a fight. They trained with weapons from a young age and were skilled by the time they became fully grown men. The Norse mythology and religion also re-enforced this path of the warrior, with brave Vikings who died in battle, blessed by Odin himself and granted access to the grand halls of Valhalla. This mix of survival, beliefs and the very nature of the Viking meant they produced many fine warriors, all of whom we plan to detail right here. Ragnar Lodbrok, one of, if not the most famous Viking warrior. Ragnar was a legendary Viking ruler who is the subject of many a story in the old Norse sagas and stories. Ragnar’s history is well documented in the old the old writings, where he is father to many sons, including Bjorn Ironside, Ivar the Boneless, Halfdan Ragnarsson, Sigurd Snake-in-the-eye and Ubba Ragnarsson. Rollo of Normandy as his name suggest was a Viking ruler of the historical French province of Normandy in France. Rollo himself is from an uncertain history, many stories have mixed lineage with Rollo, but what he absolutely was known for was his knack for war and management. Rollo was involved with many battles and wars with the Franks, who were the Germanic warriors who eventually settled in France. The famous Viking Ragnar Lodbrok and one of his wives, Kraka. Bjorn Ironside was a King of Sweden in the 9th century, and son of the legendary Ragnar Lodbrok. Bjorn was also a Viking chieftain, who along with his brother Hastein was responsible for many raids into southern Europe. The two brothers made their journeys down through Spain and the Mediterranean, into Gibraltar and then into southern France. Moving further afield the two and their forces made their way into Italy, taking part in a clever and daring capture on the town of Luna. Ivar the Boneless, whose real name was Ivar Ragnarsson, son of the famed Ragnar Lodbrok. 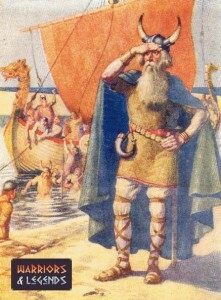 Ivar along with his brother Halfdan Ragnarsson was responsible for the invasion of parts of East England, including the capture of York, and is famed for the death of King Edmund. Halfdan Ragnarsson the son of Ragnar Lodbrok, was along with his brother Ivan, responsible for the army that landed in England on the east coast, known as the great heathen army. Halfdan and his brother conquered Northumbria, and later he would become the ruler of London. Sigurd Snake-in-the-eye was another son of the famed Ragnar Lodbrok, and as his name suggests was alleged to have been born with a unique eye, the image of a snake snapping at its own tail in his left pupil. Ubba Ragnarsson is another of the sons of the legendary Ragnar Lodbrok, and was involved with his brothers in the invasion of England, the conquering of York and the death of King Edmund. There is also some discourse as to whether Ubba is indeed the son of Ragnar with many historians citing there is little evidence to suggest this is true, and that Ubba was just a commander involved in the raids on the east of England. Erik the Red, whose real name was Erik Thorvaldsson was famed for being the founder of the Norse settlements in Greenland. Erik was born in Norway, the son of Thorvald Asvaldsson, who later fled to Iceland after being sent from Norway for Manslaughter. Once he grew into a man, Erik was as we mentioned credited with discovering Greenland, with the legends telling how Erik decided that Greenland needed a more exciting name than Iceland to tempt the other Vikings to move. Leif Erikson was the son of Erik the Red, hence his surname Erik-son, meaning of course that he was the son of Erik. Like his father, Leif was a Norse explorer who is possibly more famed than his father. Leif Erikson lived for what is thought to be around 50 years and is held as the very first Viking, and European to travel and land on the shores of America. Famous Viking Leif Erikson, a famed traveler and warrior. Sweyn Forkbeard was a king of two countries, England and Denmark, and was in fact was the son of King Harald Bluetooth who was the king of Denmark. 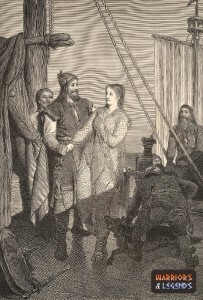 Sweyn additionaly at points in his life ruled parts of Norway while in direct competition with Eric Haakonsson who ruled a larger portion of the country. Sweyn’s rule of England officially is thought to have only lasted one year from 1013 to 1014, although Sweyn was involved in many raids on England before his short tenure as king. Gunnar Hamundarson was an Icelandic Viking chieftain, legendary for his fighting prowess and athletic ability. The sagas tell us that Gunnar was thought to have lived in the 10th century, had the skill of being able to jump his own height and armed himself with a unusual weapon for a Viking warrior an Atgeir which was a pole arm type weapon, that Gunner was suitably adept at weilding.